Ironically, right after I published my post about the little yellow messengers of spring, we had a huge (by west coast standards) dump of snow, more than a foot in all. That was followed by – no surprise – a multi-day power outage. Snow is still covering most of our garden and patches of our lawn, though it’s been melting a bit more each day. While the crocuses haven’t yet re-emerged from under their white blanket, I’ve been happy to see our weather heading back to “normal”. But today, to my dismay, it’s been snowing again. Fortunately, the Twinnies’ coats look rather cozy; in fact I expect they’re better than my parka has proved for warmth and waterproofing. Nevertheless, I’m sure the pair – like me – will be happy when spring finally arrives. 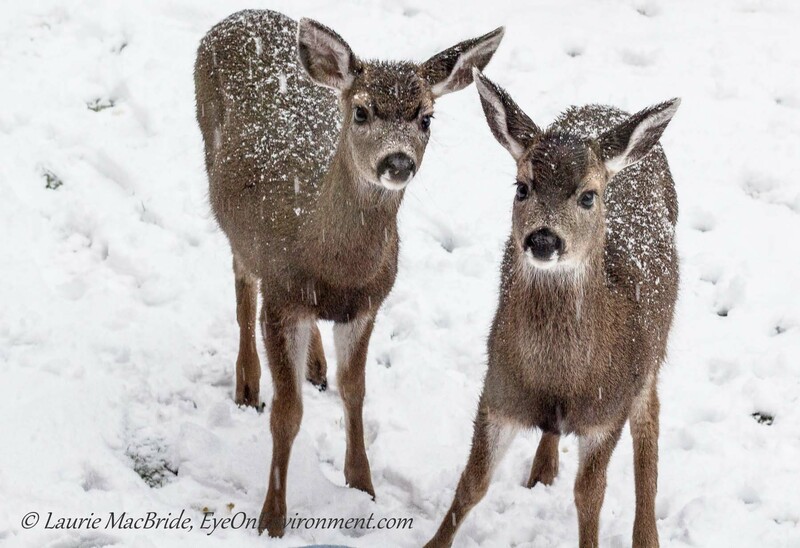 Posted by Laurie MacBride, Eye on Environment on March 4, 2014 in Animals & Wildlife, Mammals, Musings on Life and tagged cold, deer, nature, photos, snow, The Twinnies, weather, wildlife, winter. Indeed, what crazy crazy weather! I am totally in agreement with those two cute deer twins there, this is sheer madness and I think we’re ALL ready for spring to come!! Love this photo, Laurie, a really heartwarming shot my friend! Thanks Toad! The Twinnies are so doggone cute, and seem so obliging about posing for the camera, that it’s hard to take a lousy photo of them! 🙂 I agree, spring will be a huge relief this year. Spring is late this year. What is going on? !